Chambliss Auto Body Repair was started in January of 1988 in the garage of the owner’s home. In just one year, the shop grew so large that it had to be moved into a bigger space. 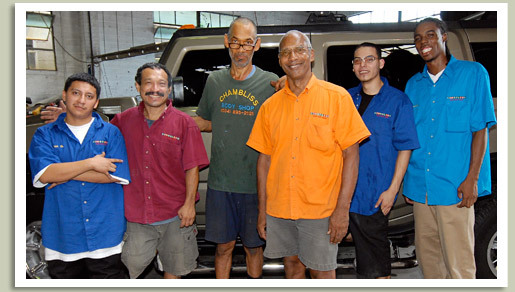 Brothers Jeffery and Derrick Chambliss, along with their partner Pedro and their staff, make up Chambliss Auto Body Repair. Back in 1975, Derrick and Jeffery began learning the trade of auto body repair and service under the guidance of Elwood, spiritual and wise teacher to the young people of their community. Learning to live a life without limitation, and not allowing money to be the only or main motivation, they were shown how to take life seriously, to be focused on the projects they were connected with and to learn, learn, learn as much as possible. In 1983, the Chambliss brothers moved to New Orleans and met Pedro, a Nicaraguan native who had learned electronics and taught reading to others in his home land. For the past 20 years, he has partnered with them in New Orleans to work on auto frame, suspension repair and measuring. Gail has done accounting since her teenage years, and has been working with Chambliss as their accountant for the last 15. What Chambliss Auto Body Repair brings to New Orleans is a desire to make a place to work, learn, and prosper available to the young people of the city. When you visit, you will see a shop that is well equipped and monitored by experienced professionals. Chambliss is heartily dedicated to providing "the best job that is humanly possible". Chambliss cares about their customers and getting the job done right.